So what exactly are these sprout tops in the standard box this week? It’s what grow at the top of a brussels sprouts plant (reminds us that Christmas is just around the corner). 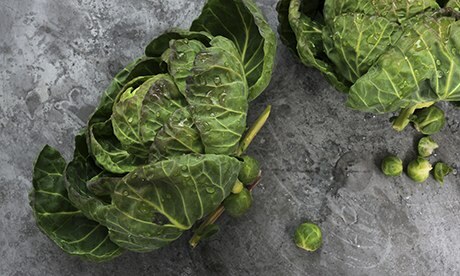 The article also has the perfect recipe for wet and dreary days: sprout top, potato and chorizo soup. Try them with browned butter and hazelnuts, bacon and onion, or chestnuts and bacon (ahh, now we’re thinking about Christmas again). They are delicious shredded, lightly sautéed and combined with leftover mash and roast meats in a patty, for a sprout top squeaker. Try topping it with a poached egg, too. How about frying with garlic and mushrooms and spooning over toast? Or a stir-fry with garlic, ginger and a splash of rice wine? Otherwise, keep it simple – steam until just wilted and top with a knob of butter and a sprinkling of sea salt, perhaps even smoked sea salt, and maybe a squeeze of lemon. Or for a fancy night in, why not try pan-fried halibut with sprout tops and a cockle, mussel and clam sauce (or any white fish woul do). Gotta check out that “submissive silkiness” now!